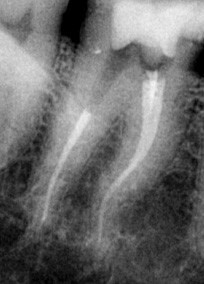 Simple, and quick root canal preparation, with a minimal number of files. 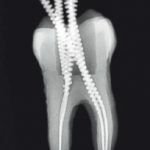 Allows a predictive treatment of the majority of root canals with minimal damage to the tooth structure, and preserving the natural anatomy of the canal. Gentlefile® system comprises single use files and contra-angle heads in order to prevent cross-contamination. The gentle action, the easy operation of Gentlefile® designated handpiece, the economical price of the files and its efficiency benefits dentists and patients alike. The file's 0.5 mm edge is sharpened at a 45°angle with a trimmed, rounded end. No need for adjustment – built-in safety mechanism eliminates the need to select parameters. Filing of dentine walls instead of standard drilling and cutting. 6,500 rpm file rotation speed, varying with load. Minimal risk of dentin defects and cracks. Removes debris with excellent efficiency. Few instruments, the practitioner follows a simplified workflow, which gains time and benefits the patient too. The flexibility of the Gentlefile, which is maintained along its entire length, allows the dentist to use the entire length of the file, meaning that in most cases one length matches all canals. The file is active along its entire length. A combination of file flexibility and centrifugal movement permits accessing and cleaning of the irregular parts of canals that NiTi files cannot reach. The surface roughness enables filing of the canal walls without screwing-in effect and easy control of the file movement in the canal. The file's flexibility and torque limitation mechanism reduce the damage potential and minimize the risk of dentin defects and cracks. 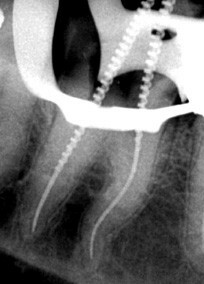 The file's movement and a low taper of GF comply with each canal unique anatomic structure and cause a symmetric removal of the dentine layer. 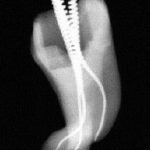 Conservative enlargement of the canal with minimal damage to the tooth structure, preserve the natural anatomy of the root and reduces the risk of the root fractures. A high rotational (6500 rpm) speed activates the irrigation solutions within the canal resulting in an improved cleaning ability. 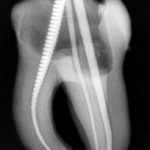 I’ve been doing root canal treatment using GF system for the last several months and I’m pleased to report that I’m very happy with the system. It uses a dedicated handpiece with a re-chargeable that is very ergonomic and convenient to use. After a short practice on extracted teeth, the tactile feedback is very good allowing precise control of the file movement within the root canal. The files come in several sizes that approximately correlate to the ISO apical diameters of the gutta-percha. The files are single-use, thus there is no concern of cross-contamination between the patients. The manufacturer claims a very low incidence of file separation canal wall perforation due to the unique file structure together with electronic and mechanical torque-controls. Indeed, it seems almost impossible to break or to course a perforation a file during instrumentation. Even when I intentionally increase the pressure – the engine just stops rotating thus preventing a breakage. The instrumentation is recommended with canals over-flowed with sodium hypochlorite. A very high rotational speed of the files activates the irrigating solution within the canal continuously during the instrumentation. 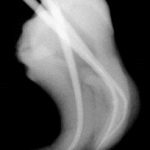 I use a regular lateral condensation for the sealing following GF instrumentation and the canals look well-shaped and prepared on post- operative radio-graphs. 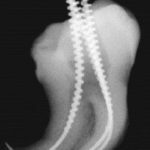 "My first exposure to the Gentlefile system was in 2009 at a dental trade show..."
Dr. Nachum J.Stone, Israel My first exposure to the Gentlefile system was in 2009 at a dental trade show. Arik Becker, the developer, aroused my curiosity with his completely new ideas, and I insisted on being part of his development team. I treated thousands of canals with the various prototypes and confirmed that the vision of a safer and easier file system was indeed viable. The unique file maintains the original canal anatomy and with less damage to the dentin. The ability to clean thoroughly without unnecessary removal of dentin was the goal of the Gentlefile. 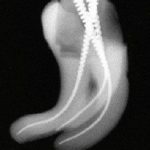 This goal is maintained even in extremely curved canals. 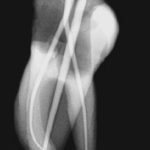 I had saved for many years an extremely curved extracted tooth, dreaming of a file that would treat it( see picture below ) . Finally in 2013 I treated that tooth. It now appears in the company brochure. After many prototypes of both the file and motor, I started using the files in live patients. The results were even more impressive than those of extracted teeth. 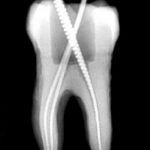 I quickly realized that the Gentlefile required much less opening of the patient's mouth, as Gentlefile does not require straight-line access like a NiTi file, and its extreme flexibility allows an approach from many angles. I can even flex the file to enter the chamber and activate it once in the canal. The only operational problem I've encountered is slippage of the silicone stopper on the file if it hits the edge of the access opening. It isn't often a problem, and it's not difficult to visualize the length of the file from the bottom of the handpiece in those cases where I remove the silicone stopper. I am very careful to irrigate between each file, and always use the Gentlefile in a wet canal. After the very first file there is always room in the canal for the irrigant, and the Gentlefile have a significant flushing and activating effect on the fluids. This gives the canal irrigants greater effectiveness and prevents build up of dentinal mud. After every Gentlefile I use a patency hand file. Usually 2-3 Gentlefile are all that is needed to complete the case. With the latest version of the Gentlefile 1 or 2 files is often enough. If the Gentlefile do not swiftly progress to the apex, a 25K file will usually clear away whatever is causing the impediment and then the Gentlefile can complete the filing to length. Filing with the Gentlefile system is stress-free, as the files do not tend to separate or change the anatomy of the canal the way rotary Niti can. Thus there is no fear of breakage, perforation, or creation of ledges. 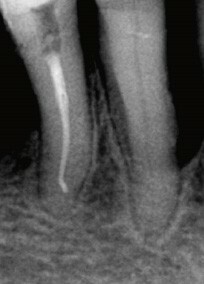 Recent research shows that rotary Niti files often cause microfractures in the dentin, something impossible with the Gentlefile files. In the course of using thousands of Gentlefile files, I have only broken 2 (the older series), both of which were when using the file in a dry canal. In both cases the broken file was quickly and easily recovered since, unlike Niti files, they are not screwed into the dentin. The light and ergonomically-balanced handpiece is very comfortable in the hand. The disposable head of the handpiece makes cleanup and disinfection a snap. The Gentlefile makes cleaning of old Gutta-percha much easier in retreatment cases, though it won't penetrate the old GP. For that, I use K files. I do all my dentistry in the microscope, generally at 10x magnification. I can easily see how clean the dentin is with the Gentlefile. This cleaning effect has also been confirmed in laboratory research that shows excellent removal of the smear layer. Before filling I re-irrigate the canals and use the Gentlefile rotary motion to activate the irrigants for 30 seconds per canal. This flushes out remaining dentinal dust and debris, leaving smooth, shiny walls. It also slightly widened the canals so that now they have approximately a .04 taper. 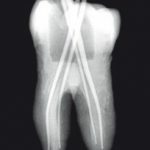 In the five years that I have been using the Gentlefile clinically, I have seen only one tooth that needed retreatment. I suspect that that one failure was a result of insufficient irrigation. The retreatment was successful and uneventful. I believe that the excellent success rate is a result of the irrigation protocol and the Gentlefile -activated irrigants.
" 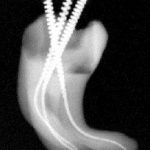 I had saved for many years an extremely curved extracted tooth, dreaming of a file that would treat it. Finally in 2013 I treated that tooth. It now appears in the company brochure"
Dear Arik! I can comment on one important thing I noticed during couple weeks of use..... noticed that when I prepare the canal with manual file, I compare it completely, ready for obturation.... and then I go into the canal with Gentlefile just in case to brush up... and in all of cases I get necrotic pulp tissue embedded in apical 2 or 3 mm, which would stay in the canal if I didn't use Gentlefile. 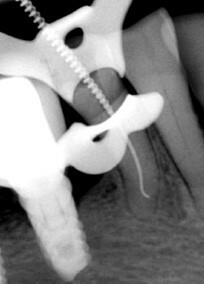 ... What I LOVE about the Genltefile is that it is made to work and work and work, ideal for the 95% of all endo we do. I am not saying it isn't possible to do also the complex cases but if you understand what I mean, the best thing is that the concept by which it works is for the majority of cases. It doesn't cause micro fractures in every tooth like NiTi just to get through the calcified obstacles that occur in 2% of canals, it doesn't decrease the structural integrity of teeth by removing 2mm of dentine at the curved part of the canal...etc...etc. … After using GF for a couple of weeks, and after lending it to a couple of my friends, I can say you hit the bonanza with this genius product. I think that GF wasn't made for the 3% but for 97% of the cases and work with GF is simple and grate filling, with outstanding results. …This rotary instrument GF is near to the holy grail of endodotics. It combines the best of manual instrumenting and gives you power from the rotation. So the pecking motions and all sorts of other motions you do to prepare the canal resemble working with the manual file. Also the feedback is like from a manual file or better. …This is what and how I am feeling when working with GF. Like having a hand file witch is turbo and also the work motions are similar to those with hand file,. …Every dentist imagines the NiTi drilling when you say rotary system. All the industry has tried to do the last decade is to simulate the hand motion. You had the Recipro and systems with recipro plus vertical motion.... I think achieved this the best way.